Venezuelan security forces and pro-government armed groups killed at least 20 people and wounded many others between Wednesday and Thursday amid a tumultuous week politically for the Socialist Latin American country. The United Nations human rights office condemned the violence by forces loyal to President Nicolas Maduro Friday, calling on all sides to “defuse the increasingly incendiary atmosphere” as Maduro’s pro-government demonstrators continue to clash with the opposition party, whose leader declared himself the legitimate president Wednesday. At least 20 people were killed this week after allegedly being shot by security forces or members of pro-government armed groups, the U.N. human rights office said, citing credible local sources. “Any violent incident resulting in death or injury should be subject to an independent and impartial investigation to find out whether there was excessive use of force by the authorities, or if crimes have been committed by members of armed groups, whether pro-government or otherwise,” the office’s chief, Michelle Bachelet said in a statement. Thousands of people take to the streets across Venezuela in protest against Pres. Nicolas Maduro. 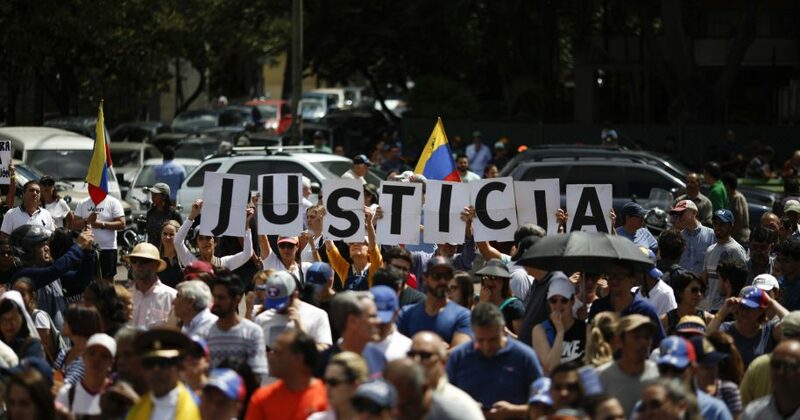 U.S. President Donald Trump endorsed Venezuelan National Assembly President Juan Guaido as the country’s legitimate president Wednesday after large crowds of demonstrators took to the streets to protest devastating food shortages and an economic fallout that has driven over three million Venezuelans out of the country. Do you think the situation in Venezuela needs intervention from the United States? Maduro retaliated this week by severing diplomatic ties with the U.S., dispelling U.S. diplomats in Venezuela and closing the embassy and U.S. consulates. Several other countries followed Trump’s lead, including Canada, France and several other Latin American countries. The Venezuelan Army declared its loyalty to Maduro Thursday, saying that the opposition’s moves to overthrow him amounted to a coup, The New York Times reported. Democratic Minnesota Rep. Ilhan Omar similarly accused the Trump administration Thursday of waging a “coup” against the Venezuelan government by recognizing Guaido. Democratic New York Rep. Alexandria Ocasio-Cortez, Omar’s fellow freshman lawmaker, was not as quick to pick a side when asked to comment on the Socialist country’s crisis.